United Technologies Center offers Maine high school students modern, hands-on training in technical programs including Construction Technology, Public safety and more. Deputy Chris Watson and Sgt. 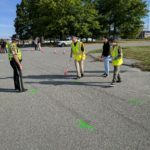 Ray Godspeed of the Penobscot County Sheriff’s Department work with UTC Law Enforcement students on the details of accident reconstruction.